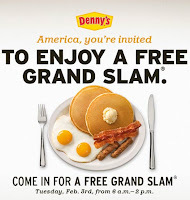 I'm sure many of you already knew, but you can get your FREE Grand Slam breakfast today only from 6am-2pm. So, go treat ya-self!!! * FREE Shipping on any $40 order from Current Catalog. Offer expires February 28, 2009. Need to send some Valentine's goodies? * 15% Off All Items for Valentine's Day at David's Cookies! Use Coupon Code VDAYLS15A at Checkout. Valid Thru February 14, 2009. Click Here. * Free Shipping on Select Items for Valentine's Day at David's Cookies! Valid Thru February 14, 2009. Click Here. * Valentine Gift Baskets from JustBecauseBaskets.com - save 5% by using code: SAVE5 at checkout. Free Shipping on select baskets. Want your Valentine to smell pretty? Getting in shape this year? Ooo, I'll have to check that Denny's deal out, thank you for sharing & HAPPY ANNIVERSARY lady!! Nice question of the day, hehe...sounds like one of mine! Wonder how many people I'd have to maim to get that Denny's breakfast. Great blog! :-D Hope to see you on mine soon. Happy Anniversary and enjoy your breakfast! Yay! Happy Anniversary. I hope you have a marvelous day. Happy Anniversary! Hope you get some time together to do something fun! Happy Anniversary! Thirteen is a very lucky number for an anniversary. Have a terrific day with the one you love! Grrr!! Does anyone else want to throw something when you get done typing your comment and blogger glitches and tells you "Sorry" ?!!!!! Here we go again! First off, Happy Anniversary!!! I wish we had a Denny's close by! What are you going to do this weekend when your hubby is out of town at a dirt bike race that wives are not invited to? Happy Anniversary!!! Did I hear correctly.....WA in March???? Happy Anniversary... the teenager is trying to talk me into running to Denny's right now... I'm not sure I"m up for it, but free is so tempting! At one Denny's, a fight broke out in the parking lot as lines of hungry patrons trickled into the street. One man was assaulted but declined medical treatment in favor of breakfast! Happy Anniversary! Hola from Sits! I just thought I would stop by and say hello!!! :o) Have a good day! Hey, happy anniversary! We're just 364 days ahead of you, if I did the math right. Tomorrow, we'll celebrate 14 years. Happy happy one to you! A cheese stick and some cashews! Happy Lucky Anniversary!!!!! Congrats on making it 13 years.... here's to many, many more!!!!! How weird would it be if your anniversary were on Friday?? The 13th?? Answer: That question was lame. I just felt like saying it. I heard about that denny's bfast thing, but didn't take advantage. Silly me! Thanks for all your tips. Have a happy day.